The US House of Representatives passed legislation that would punish China for undervaluing its currency and harming the competitiveness of US manufacturers and exporters, in a move that could heighten trade tensions between the two countries. Although the bill’s fate remains unclear, since it still needs to move through the Senate and be approved by Barack Obama, US president, its bipartisan passage in the House by a wide 348-79 margin reflects growing frustration with China’s economic policies. “If China wants a strong trading relationship with the United States, it must play by the rules,” Nancy Pelosi, Democratic speaker of House, said ahead of the vote on Wednesday. Some of the rhetoric was even stronger. “They cheat to steal our jobs,” said Mike Rogers, a Republican from Michigan, while Dana Rohrabacher, a Republican from California, attacked China’s “clique of gangsters” that was doing “great damage to the people of the United States of America”. Most Republicans supported the legislation, as did almost all Democrats. As the year ends, all of us wanted to thank everybody for stopping by and reading us over the last year. Have a happy -- and safe -- New Year's Eve. We'll be back on Monday, bright and early, to start the new year. I decided to go out on a limb and place my economic predictions for the last year of the first decade of the 21st century for all to see and ridicule later in the year (and probably now too). I am not very optimistic about our prospects for a robust economic recovery next year, but at this time do not see a double-dip recession either. Since these are predictions, this post is graph free. 1. The US economy stagnates after a robust Q1 (3%+ growth). I see full year GDP coming in around 1.5%. 2. That low GDP also means a lack of job creation. While I do think we will get our first initial positive print for jobs in a week (and November will be revised to a gain), I do not see the gains being large enough over the course of the year to make a significant impact on the unemployment rate. I see U-3 at 9.1% at years end. 3. Interest rates are an interesting topic right now, as the Fed is getting our of quantitative easing and we are floating a ton of debt to a world that may not be able to continue to afford it with our decline in consumer spending. I think interest rates are going to play a large part in the slowing of GDP as the year goes on, as I see the 10-year hitting 5% in 2010 (and on their way up). 4. Inflation has many people scared with the Fed's easy money policies, but I just don't see it at this point outside of a potential re-spike in commodities. I think we end 2010 with year over year inflation at 3.2% (that is CPI, not core). 5. In 2010, I think the housing market will finally stabilize (albeit at a lower level) and see price gains for the year of .1%. 6. Finally, the dollar. After rallying in Q1 on GDP growth, I think our debt and stagnation will cause the dollar to fall again, ending the year at $1.58/Euro. The S&P 500 will end the year at 1190 (with a range of 1020-1230). Republicans will make major gains in both the House and Senate, but will not take either house (53D, 45R, 2I in the Senate and 224D-211R in the House). And for all you gold bugs out there, I think gold ends 2010 at $1050/ounce. The latest gain boosted the SA index from 103.6 (2000=100) in October to 106.4, its highest level in a year. Similarly, Shoppertrak reported that sales increased 8.8% for the week ending December 26 compared with 2008. You may recall that last week, sales only declined -1.2% YoY even though the East Coast Megalopolis was crippled by a blizzard. Railfax reports that all categories of carloads except for coal were up, and up substantially, from the same week last year. Autos in particular are up 52% YoY. The story is similar on a 4 week basis. Also, autos are about even with last year on a quarterly basis. Since auto manufacturers were cutting drastically in Q4 2008, this is added evidence of a rebound in that sector that is likely to show up in the December auto sales figure next week. Between the railfax transportation data and the retail store sales data, it certainly appears that December's retail sales are likely to be a strong number. The BLS reported the lowest initial jobless claims since August 2008 at 432,000. Although much of the decline in this number may be an overreaction of seasonal adjustments, the trend for the last two months is still down strongly. The EIA reported that gasoline went up about 1 cent to just over $2.60 last week. Essentially the price of gas has been flat for the last two months. Usage increased slightly more compared with last year. The Daily Treasury Statement for December 29 indicated $137.4M in withholding taxes paid so far this month, compared with $149.8M for the same date last year, indicating government finances are still under severe stress. Finally, closing this last post of mine for 2009. let me wish all readers a happy, safe, and prosperous New Year. Next week, in addition to reporting on the plethora of important new data, I hope to post both a review of my own work for 2009 and an outlook for 2010. The BLS reported that for the week ending December 26, seasonally adjusted initial jobless claims decreased to 432,000, down 22,000 from last week's revised 454,000. The 4-week moving average is now 460,250, compared with 465,750 last week. The 4 week seasonally adjusted moving average is a little more than 31% lower than the peak of 658,750 on April 3 of this year. (The last two "jobless recoveries" coincided with new claims declining no more than 20% from peak). Unadjusted, there were 557,155 new claims, a decrease of 8,088 from the week before, showing how much seasonal volatility exists in the weekly numbers at this time of year. 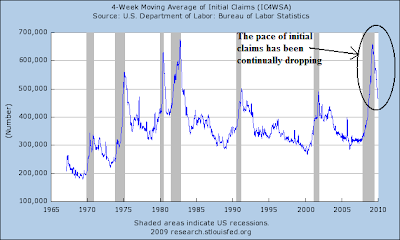 Today's reading is well below the initial claims numbers for this time last year, and seasonally adjusted is the best number since August 2008. We are getting close to the point where my research (that claims had to fall ~20% for at least two months) and also the "mental note" of Prof. DeLong et al that initial jobless claims had to fall to 400,000 before jobs would be added, are both going to be correct. The incoming data continues to suggest that more likely than not we are going to get a positive payroll number for December when that figure is released next Friday. Editorial note: All of the above employers who pink-slipped employees during Christmas week are true grinches -- and that's being kind. One of my favorite lunch places closed last week. Those employees - none of whom were earning very much I'm sure - got a wonderful Christmas gift, didn't they? Why can't employers at least wait until the holiday season is over? Bastards! The overall trend continues to to look very promising. A.) Oil prices have rebounded since mid-December. They have risen through the EMAs to hit upside resistance at the 200 day EMA. Also note the 10, 20 and 50 day EMAs are moving higher with the 10 day EMA moving through the 20 and 50 day EMA. C.) The A/D line has not increased indicating that we have not seen a significant influx of new traders yet. A.) Prices broke a 5-day uptrend today. After prices broke the trend they formed a good triangle, consolidating losses before breaking higher at the end of the day. On Christmas Eve, the Treasury announced that they were changing the funding situaition for Fannie and Freddie. The blogs erupted in unison -- there was a conspiracy! We're all going to hell! The sky is falling. Let’s start with “uncapping” Treasury support under the Preferred Stock Purchase Agreements (PSPAs) authorized by the Housing and Economic Recovery Act (HERA) of 2008. Under the new calculation the maximum amount either enterprise may draw is the greater of $200 billion, or $200 billion plus the cumulative amount of deficiency amounts covered by Treasury preferred purchases as of December 31, 2012, less any surplus at December 31, 2012. Deficiencies are negative net worth measured in any quarter; these require the enterprise to sell preferred stock to the Treasury to maintain net worth at zero. Surpluses are positive net worth. Please notice that the new calculation provides for the possibility that the enterprises will not continuously run in the red. The mechanics are a little vague - suppose an enterprise draws $210bn through Q111 but emerges with a $20bn surplus at December 31, 2012. Does the Treasury claim the surplus at that time? Nonetheless, including surpluses in the cap formula is an important and appropriate adjustment. Freddie Mac did draw a total of $51bn over the first three quarters the agreements were in place (Q3 and Q4 of 2008, Q109), but it finished Q2 and Q3 with positive net worth ($8.2bn and $10.2bn respectively). It had no need to draw on Treasury for funding. More fundamentally, the game has radically changed since Congress (spurred on by a strong scapegoating and retribution-mongering spirit) and the Paulson Treasury wrote the rules for GSE support. Private lenders (including the biggest ones paying back their TARP money, Ms. Story) are making few residential mortgages for their own books, and there is NO investor appetite for privately securitized mortgages. And furthermore, between FAS 166/167 and proposed requirements that securitizers retain significant risk, prospects are not bright for a renewal of private securitization. The GSEs have a much higher share of HAMP trial mods compared with their share of overall delinquencies for the mortgage universe. No PSA constraints and relaxed NPV requirements for mods make it easier for servicers to initiate trial mods on GSE-backed loans. Third, there is the simple fact that people who write about the economy don't understand the economy. Once again, writers have demonstrated they know squat about how finance works. The Institute for Supply Management in the Chicago region reported its Purchasing Manager's Index at 60.0 this morning (above 50 means expansion). This is, quite simply, a blowout to the upside. All categories of the Index improved: New Orders, Production, and Backlogs all increased, as most importantly for most of us, Employment. At 47.5, employment is still mildly contracting, but is listed at 50.2 seasonally adjusted (because layoffs are more typical at this time of year), meaning slight expansion -- the first time since before the Recession. I am unable to copy and paste the representative comments mentioned in this month's survey, but they fall into two camps: (1) employers remain grinches with employee salaries and bonuses; and (2) employers are "hoarding jobs", still waiting to see if the increase in orders holds -- and ironically, this is holding back an even stronger recovery, as the backlog in vendor deliveries grows, preventing faster output. Beyond that, according to Briefing.com, the Chicago PMI has a 91% record of anticipating the move in the ISM Manufacturing Index, which will next be released on Monday (of course, that wasn't true last month, which also featured an increase in the Chicago PMI). Even more encouraging, the Chicago PMI never went above 60 during either of the two "jobless recoveries" of 1992 and 2002. 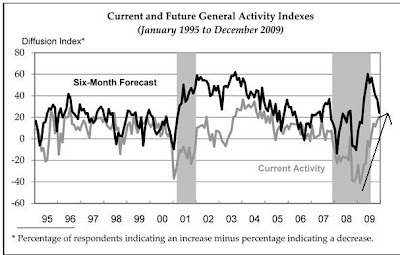 The PMI was above 60 from late 2003 through 2005, and from late 1992 through 1995 and the tech boom. This rapid post-recession manufacturing expansion was last seen during the 1983 V-shaped recovery from the last very deep recession of 1981-82. I suspect the revival in the automotive industry (Edmunds.com is expecting over 11 million SAAR vehicle sales in December) is the main driver behind this number. Bottom line: this is more evidence that manufacturing is indeed having a V-shaped recovery, and is consistent with an improving jobs picture. 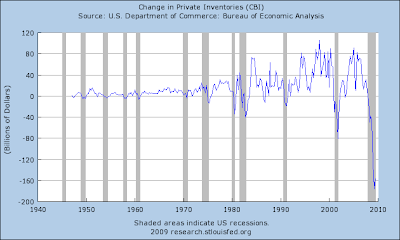 Total inventories have stopped dropping; they have found a bottom. GMAC Financial Services is close to getting approximately $3.5 billion in additional aid from the U.S. government, on top of $12.5 billion already received since December 2008, according to people familiar with the situation. The announcement, expected within days, will coincide with GMAC taking additional steps to absorb losses related to its mortgage operations, these people said. The cleanup is designed to return the Detroit-based finance company to profitability in the first quarter of 2010, according to one of these people. We're now at Stage 4 of the process. A.) Copper is in a clear uptrend. B.) As prices have risen they have also consolidated at various times. C.) Prices have also broken through key areas of resistance. D.) Momentum is fair. It has risen for the last two peaks with the second MACD reading being above the first peak, but there isn't a strong trend in place. E.) Money continues to flow into the market. This is very important as it indicates traders have been adding to their positions over the last six months. Over the last few days, I've been wondering whether or not the markets are lining up for a post new years rally (see posts here, here and here). To that end, I think investors feelings about risk are very important. The chart about is of the IWMS, or the Russell 2000. Notice that the index has recently broken through resistance (B), although on weak volume. Prices are currently consolidating gains (A). This charts tells us that investors have a higher risk appetite. Support at line (B) is important. In housing, the S&P composite index of home prices in 20 metropolitan areas was flat in October, falling short of expectations for a rise of 0.2 percent according to a Reuters survey. September's index was revised upward to a gain of 0.4 percent, from a previously reported 0.3 percent. Only seven of the 20 cities in the composite index had month-over-month gains in prices in October, S&P said. A sustained upturn in home prices is seen vital in the fledgling rebound in the hardest hit housing market since the Great Depression. There has been growing concern that record-high levels of foreclosures will mount even further and depress prices anew. "The report signals that we have a growing stabilization in house prices. Obviously it's at a very slow pace and that is because the market is still saddled with a significant amount of inventory," said Anna Piretti, senior U.S. economist at BNP Paribas. "We're likely to see some negative cross currents come into home prices in November, but that doesn't really change the trend -- the trend should be toward stabilization." S&P said the annual rate of price declines improved, with the 20-city index dropping 7.3 percent from a downwardly revised 9.3 percent in September. A 7.2 percent downturn was forecast in the Reuters survey. All 20 metropolitan areas and both the 20-city and 10-city indexes showed smaller rates of decline in October compared with September. Let's take a look at the charts to place the numbers in perspective. As always, click for a larger image. Last months month to month percentage change was at 0%. This was after 5 months of increases. In other words, it's important to remember that nothing moves in one direction at the same time. However, also note that only 7 cities saw month to month increases. Ideally, we'd like to see more. However, this is only one month of data meaning it could simply be an outlier right now. Above is a chart of the month to month increases. Notice we have 5 months of increases behind us right now. Overall, this is a fair report. While the continued year over year improvement is a good development, the fact that the month to month gain was 0 and a minority of cities saw increases is not good. But, we will need a new more months of data before we can say one way or the other that this is a good or bad month. Confidence among U.S. consumers rose in December for a second month as pessimism over the outlook for jobs diminished. The Conference Board’s confidence index increased to 52.9, in line with the median forecast of economists surveyed by Bloomberg News, from 50.6 in November, the New York-based research group said today. Another report showed home prices climbed in October for a fifth consecutive month. The report showed consumer attitudes about current conditions decreased to the lowest level in 26 years and expectations over wages also fell, a reminder that spending may be slow to recover with government assistance. A jobless rate that is forecast to exceed 10 percent through the first half of next year may prompt policy makers and retailers to maintain tax breaks and incentives to entice buyers. The overall reading is still low by historical standards. My guess is this number is all about the job market. Unemployment at 10% will do that. Consider the above charts together. Click if you need a larger image. The top is the year over year percentage change in inflation, while the lower is the yield on the 10-year Treasury. Starting in about 1965 inflation started to increase. This reached its zenith in the late 1970s/early 1980s. Over the same period we saw interest rates increase. Why? Because investors began to demand they be compensated for exposing themselves to inflation risk. 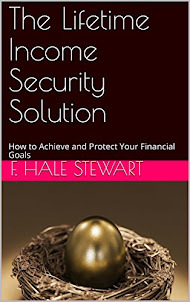 As inflation rises it eats into the steady income stream that comes off a fixed income investment. Now look at sections B and C on the inflation rate chart. Over the last 20 years we've seen inflation come down. In the 1980s we saw inflation move between approximately 2.5% - 5%. In the 1990s we saw it fluctuate around 2.5%. Over the same period we saw the 10 -year Treasury yield decrease. Why? Because treasury investors saw their investments were not being eaten away by inflation. Therefore, they did not need high yields on their investments, thereby driving Treasury yields lower. The above information tells us there is at least a strong correlation between inflation and Treasury yields. Again -- from an investment perspective this makes perfect sense. Some people will read this and say "Shadow stats says the US is manipulating inflation rates." To that I would answer the following. If there was a great conspiracy over the last 30 years to manipulate inflation rates real life experience would trump the manipulation. For example, suppose the "official" inflation rate was 2%, but actual real-life inflation was 10%. Do you really think people would still be buying fixed income securities that bore a low interest rate? And would investors still be buying Treasury securities at such a rate as to send interest rates on a decreasing trajectory for over 20 years? In other words, Shadow Stats is crap. Please don't bring it up again. But more to the point. As we move into a period of high government issuance of debt, it's important to remember that while supply is a determinant in interest rates (more debt = higher rates to attract investors) actual inflation along with inflation expectations are just as important. In fact, considering the rate of government debt increase we saw over the same period (1980 and onward), inflation expectations are just as important as overall supply. Have you ever tried to visualize what one trillion dollars looks like? There are some attempts to do so on the internet, but I've found them unhelpful, as they don't really help to truly "visualize" -- visually represent -- what it looks like. So I've taken it upon myself to ascertain what $1,000,000,000,000 looks like in terms we can all get our heads around. We're going to use $100 bills (for reasons that will be immediately obvious). We know that a U.S. banknote measures 2.61" x 6.14" x 0.0043". So...imagine a football field -- 120 yards x 53.5 yards, or 360' x 160' -- covered with ~517,500 stacks of $100 bills, each stack ~6' 11" high and comprised of ~19,200 bills ($1.92 million/stack). So as you're watching the upcoming bowl games or NFL playoffs, impress your family and friends by asking them to envision the entire playing field -- every square inch -- covered in neat ~7' stacks of $100 bills. That, my friends, is $1,000,000,000,000. A.) There have been numerous gaps down. That tells us that traders are dumping IEF shares. Also note the volume spike yesterday, telling us that traders dumped a lot. B.) The EMA picture has turned decidedly bearish: the shorter EMAs are below the longer EMAs, all the EMAs are moving lower and prices are below all the EMAs. A.) Prices moved between two points for roughly four months. C.) Approaching price levels from the end of last summer. In short, there is a big migration out of the Treasury market right now. This morning a ran two posts looking at the possibility of the market moving higher after the first of the year. Let me plan devils advocate with those posts with the above chart of the SPYs. Notice that the latest rally -- which took us through key resistance -- occurred on diminishing volume. This is not what we want. Instead we want increasing volume that shows people are more and more interested in the rally. This goes to an important point: no rally is prefect. There will always be technical flaws. Technical analysis is as much about the weight of the evidence as each piece of evidence. In the first post in this series, I looked at how we got here. 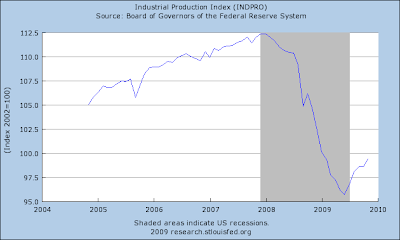 As a quick recap, at the end of 2008 the economy was facing a deflationary threat. In response, the government put a stimulus program into place and the Federal Reserve lowered interest rates to near zero. Today's question is how has this paid off? At the national level, manufacturing is rebounding. Industrial production bottomed mid-year and has risen four of the last five months. 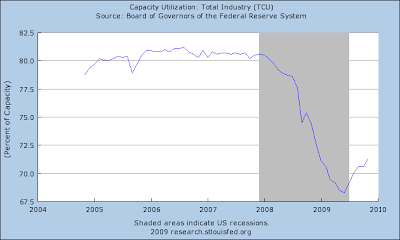 Capacity utilization also bottomed mid-year and has risen four of the last five months. The ISM index bottomed last year, but has also been rising. The Philadelphia Fed's index of manufacturing also bottomed at the beginning of this year and has been rising since. The Chicago index bottomed mid-year. This index appears to be tracking the overall industrial production numbers a bit more closely. The New York Fed's manufacturing index started to rise in March of this year. It has fallen the last two months and is currently right at the line between expansion and contraction. 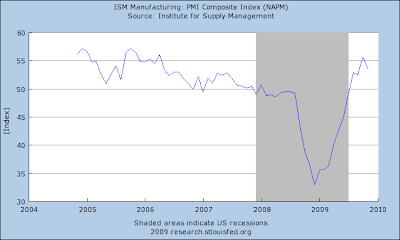 This is the only manufacturing index to show a decrease, indicating this is probably an outlier. However, it does bear watching. In short, the manufacturing sector took a big hit at the end of last year. However, national level industrial production and capacity utilization have been increasing for the last few months. The National association of purchasing managers index has risen since the end of last year. All three major regional indexes are showing expansion although one (the Empire State) has dropped the last two months. In short, the vast majority of indicators are showing expansion. The ISM services index dropped last month to 48.7M. which indicates contraction. However, the overall trend for this number is still higher, as evidenced by the increase that started at the end of last year. The trend is still up. Let's break the housing market down into new and existing home sales. All the charts are from Calculated Risk. 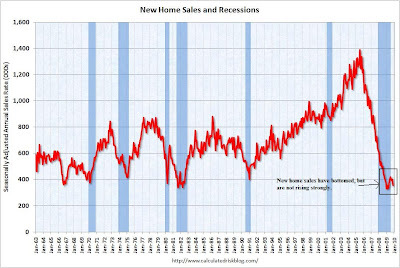 New homes sales have bottomed. However, they are currently near their bottom. They have increased as strongly as existing home sales. 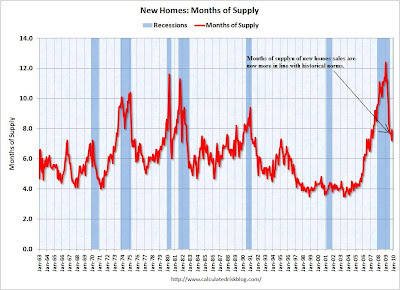 The months of available supply number is also decreasing and is approaching the historical norm as well. 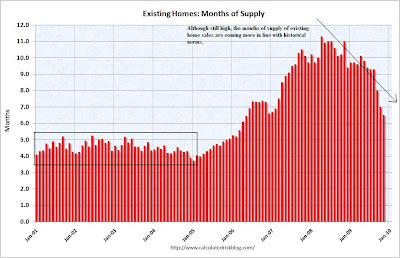 Existing home sales have been increasing since just after the beginning of the year. 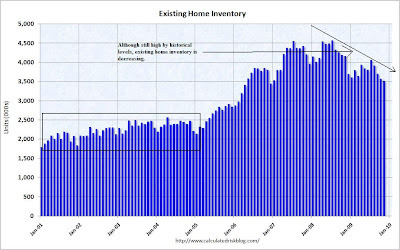 This the total inventory of available homes is still above the historical norm of approximately 2,000,000 - 2,500,000, the overall number is still coming down. The months of supply at the current sales pace is still above the historical norm of roughly 4-5 months, but this number is coming down as well. So -- what does all of this information tell us? 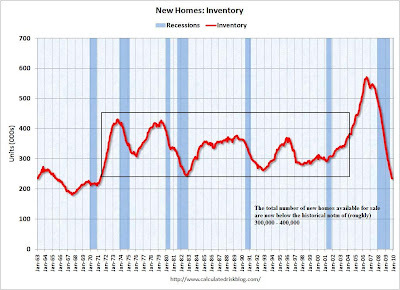 New homes have cleared excess inventory. That's a healthy development because it indicates the overall glut of that particular market is gone. 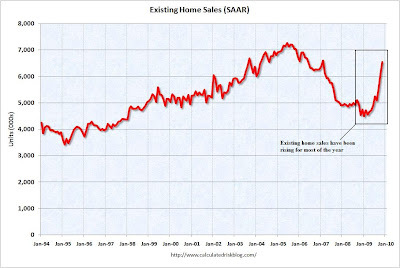 But while sales have bottomed, they have not advanced as strongly as existing home sales. The pace of existing homes sales has increased smartly this year. However, we still have excess inventory along with a high months of inventory at the current sales pace. The housing market is healing as evidenced by the sales pace of existing homes and the inventory situation in the new homes market. However, the pace of new home sales and inventory situation in the existing home sales market is still troubling and indicates we still have some room to improve. But, considering where we started the year, this is good progress. This is a broader measure of consumer activity and therefore more complete than retail sales. Overall PCEs are trending up, although the rate of increase is moderate; ideally we'd like to see a stronger upward move. Now let's break these numbers down into their smaller subparts from the the largest sub-part to the smallest. 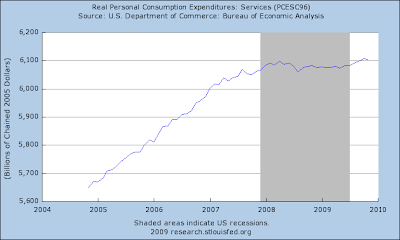 Expenditures on services comprise about 65% of all PCE sales. However notice that overall purchases on services has plateaued over the last roughly two years. There has been a slight uptick over the last few months, but it is not a strong upward move. 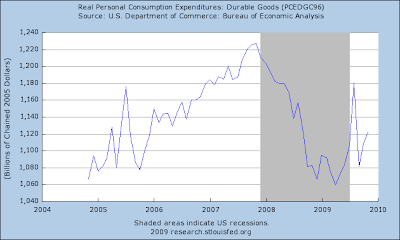 Expenditures on non-durable goods has increased over the last few months, but again, it is not as strong a move as we would like. 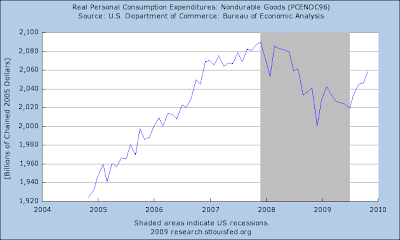 Durable goods -- which comprise about 11% of PCEs -- have bottomed. There was an upward spike from the case for clunkers program. However, sales fell from that level, although they have bumped up a bit since then. Overall, PCEs have clearly bottomed. They are moving higher, although at a slower pace than we would like. 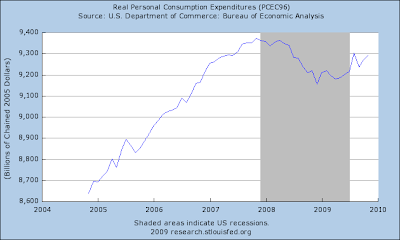 This situation most likely represents a retrenchment for the US consumer as he spends less and saves more. For many people this is the one sticking point about the recovery. While the point is valid, it's also important to remember a few basic economic issues. First, the unemployment rate is a lagging economic indicator. That means it will start to drop after the recovery has started. 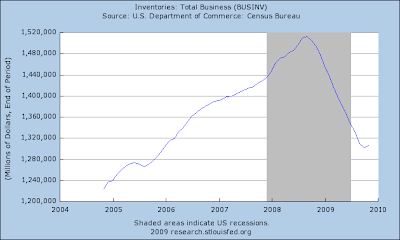 The reason for this is simple; businesses won't start hiring until they are certain the recovery is in place. That means businesses need to need a few quarters of GDP growth before they start to hire workers. In other words, the pace of job losses has been severe to say the least. That means the recovery will be long and difficult. And it has been. The second point from the chart above of establishment job losses shows that we are almost at the rate of 0 job losses. Put another way, we are near a time when the economy should finally start adding jobs sometime in the next few months. It's important to remember there are two job surveys -- the household and establishment. The unemployment rate comes from the household survey. While the pace of increases is slowing we have not had a firm drop in the overall rate yet. But -- and as mentioned above -- the unemployment rate is a lagging indicator. This tells us the recovery is still new. There was much hay made of the fact that of the 2.2%, 1.45% came from motor vehicle output, and especially that this was from the cash for clunkers program. In response, consider these points. First, a large number of the people complaining about that figure are the same people who argued for the first stimulus and in some cases are arguing for a second stimulus. In other words -- there people will complain no matter what. Secondly, government spending accounts for 20% of GDP growth throughout the economic cycle. Finally, it is standard for the government to use programs to bring an economy out of a recession. A favorite method is increasing the upfront depreciation deduction. However, there is nothing wrong with using standard demand simulating measures as well. So, some type of government programs are standard for getting an economy out of a recession. 1.) Manufacturing is making a strong recovery. In short, the recession is clearly over. However, growth is weak. But, considering where we started the year, we're actually doing pretty well. I describe the initial phase of the next expansion the "fits and starts" expansion because not one of the four elements outlined about will lead completely or continually. I think it's far more likely we'll see an increase in consumer spending one quarter followed by increased stimulus spending and an increase in exports the next quarter. In other words, various economic sectors will take the lead one quarter and then fall back. In other words, we'll see fits and starts from the above sectors. I still see a slow recovery with GDP growing between 1%-2% every quarter. It will not be gangbusters growth by any stretch of the imagination. A.) Treasury prices have been dropping all month, falling 4.5%. Also note prices are below the lows of early November. B.) The EMA picture is turning negative: all the short-term EMAs are moving lower and the shorter are below the longer. In addition, prices are below all the EMAs. D.) Money is flowing out of the market. Finally, notice the market is approaching key levels established in August. This price level will be an important test. A.) The transports have moved above key resistance. However, prices have consolidated rather than moving higher. B.) The EMA picture is bullish: the shorter EMAs are above the longer EMAs, prices are above the longer EMAs and all the EMAs are moving higher. D.) Money is flowing into the security. A.) Earlier this year the IWMs formed a double top. B.) However prices fell to around the 200 day EMA and have since been rallying. Now prices have risen above previous levels. C.) The EMA picture is bullish: the shorter EMAs are above the longer EMAs, prices are above the longer EMAs and all the EMAs are moving higher. E.) Money is flowing into the security. Notice the big increase over the last approximately week. The IWMs are a good indicator of risk tolerance. A.) Prices have broken through key resistance levels. D.) Over the last three months there has been no major outflow or inflow in the QQQQs. A.) Is a consolidation area that has lasted over a month. Notice how weak the candles are in this area -- there are many with short bodies indicating narrow trading ranges. In addition, there are longer bodies indicating a large amount of volatility. B.) Prices, however, may be moving higher right now. Traders have consolidated their gains. C.) The MACD is giving a buy signal. D.) The A/D line tells us that during the consolidation we didn't see a huge flight out of the market. Instead, we saw people biding their time. Consider these points in conjunction with these posts from last week. The general trend for the stock market this year is up which the general trend for the bond market is down. In short, money is leaving safe investments and moving into riskier assets. The bond market may be signaling a stronger recovery. The long end of the bond market has sold off indicating investors may be leaving the safety of US government securities.